I think these are reasonably good images [08/04 pics] for an object 93,000,000 miles away. In many ways, I wish it were more than a disc and on Monday, a disc with a black disc in front of it, except for those who experience totality. If I risk possible rain and cloudiness, maybe I can get a once-in-a-lifetime capture. I have settled on capturing a banana sun. This validation was helpful and will save time Monday. I know where I should place equipment to best capture the eclipse on the First Presbyterian Church Grounds. It is not where I set up on arrival [above]. The sun’s path is masked more than I thought by the oak tree behind my equipment. Clear sky is necessary for easy tracking and usable pictures–at least I hope so… I relocated here and believe it is best of the options at the church. Anyway, I will be proximate to my three systems. The view from this location. 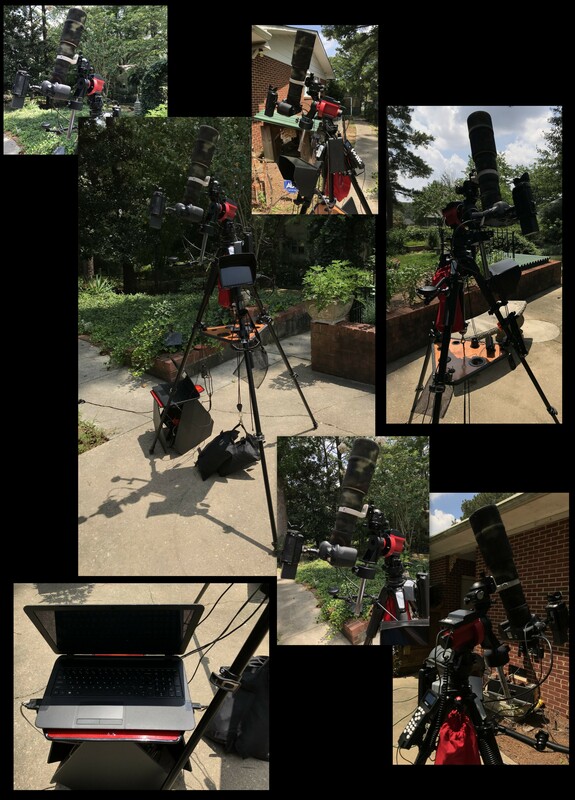 Hopefully, I will capture the sun as the moon passes between it and the earth, casting its shadow upon us–a partial eclipse for this town; record a timelapse video, using my iPad, of ground activity at the First Presbyterian Church; and, record a ground-level video, using my Sony HandyCam, of things near my setup. I finished the woodwork just over a month ago. Olivia delivered her artwork yesterday. Thank you, Olivia! I put the solar filter in today and snapped these pictures. They are not your typical cardboard eye protection. 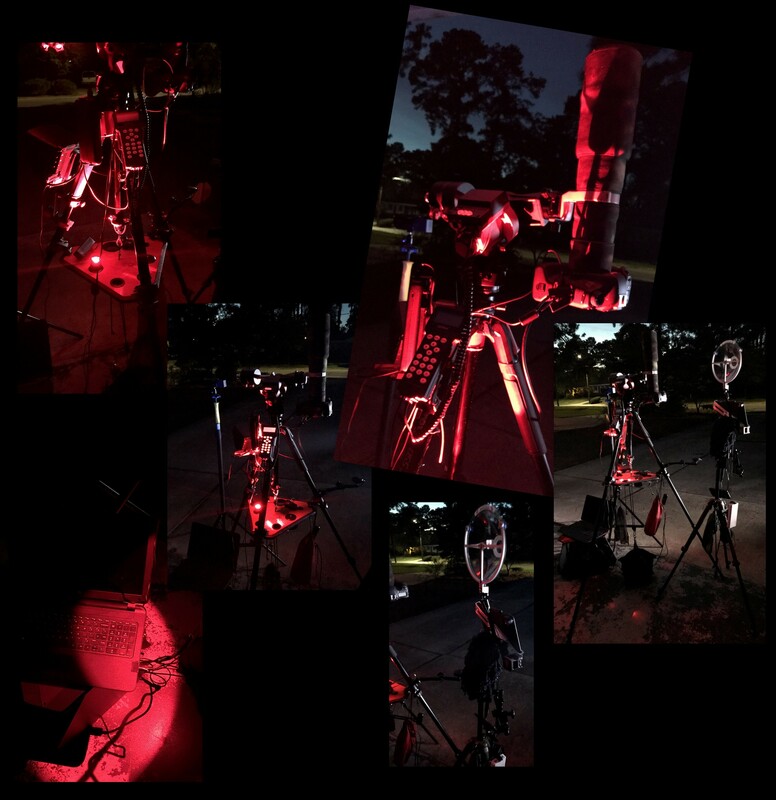 Thamks to iOptron Support–Kevin & John, I am now comfortable with tracking at 800mm STILL, spot on 30-minutes later. Today was to have been onsite test shooting; however, I needed to resolve shooting the sun near the zenith. Thanks to Kevin and an email picture, that is resolved. Testing is a good thing! Get a fix on the sun before high-noon and verify good tracking and get a GOOD focus. Looking at pictures of the sun, I want the 800mm pics. I think a part of the challenge is the sun to so high in the sky that my latitude has to be changed for the camera to see the sun. doing so will result in tracking errors. I need the camera to point almost vertical. The sun is supposed to be @ 61° at max 08/21. I plan to shoot on site Thursday. I know more then. Clouds and trees are not my friends when there is a solar filter on the lens. The HandyCam’s image is not sharp enough to make its use worthwhile. 800mm is too tight to keep the sun centered in the frame–shoot at 400mm. I think this 2X extender/teleconverter is better suited for pictures at a distance when there is no motion.